So here is one I totally wrote off. 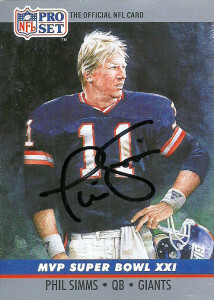 It seems rarer and rarer to get these long waits back, but finally on the second tenacious attempt, I got Phil Simms. Simms had previously returned cards I sent in 2011, -7 months later. Even more frustrating for me, he continued to spontaneously respond to autograph requests through his address. I went ahead and fired out another shot. I had definitely given up on this after the one year marker, and became so sore about it, that I was more than happy to acquire a Simms through the ‘Canton Acquisition’. Recently again Phil had shown up on the autograph blotter, so I held out hope that something was going to happen, and lo and behold the Score, Pro Set, and Action Packed cards all came in the mail autographed at last, – a brisk 470 days after I had sent them. Simms went to little known Morehead State- a school known more for its modest affordability, underrated class sizes, and a radio telescope/space tracking system that reaches the stars. Phil grew up in the Kentucky area, so this made perfect sense to him to attend here. Among his highlights for the college were leading the Ohio Valley Conference in passing in 1977, but as the team transitioned to a ball control offense his senior season, Phil’s numbers sunk. He had an impressive workout at the combine, so much so that the 49ers were planning to sneak him in as a 3rd round pick, -but in the end, they were beaten to the punch by the Giants, who invested a 1st rounder into Simms, calling him a ‘value pick’. As the boos reigned down from the audience who hated the pick, Simms wasn’t too happy about playing for New York either. Still, Simms managed to prove everybody wrong, and by the end of his rookie season, he finished second (to future teammate) Ottis Anderson in voting for rookie of the year in 1979. 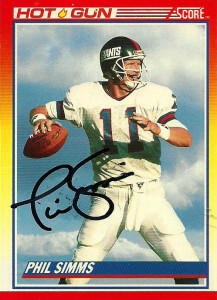 In 12 starts his rookie year, Phil threw for 1,743 yards and 13 touchdowns. The Giants continued to struggle until 1984, with injuries, inconsistent play, quarterback controversies, and a head coaching change to Bill Parcells, but still Phil persevered, with a bit of work, conditioning, and tutelage. He’d turn it all around that year throwing for a club record 4,044 yards and 22 TDs in his first 16 game slate, then turn around prove it wasn’t a fluke throwing for 3,829 yards and 22 TD in 1985. 1986 proved to be the pinnacle of Phil’s career again with another 20+ TD season and nearly 3,500 yards, he led the Giants to victory in Super Bowl XXI. His Super Bowl effort (22-25, 268 yards, 3 TD, 0 Int) earned him MVP honors and it remains one of the best performances in league history. He’d return to the Super Bowl again in 1990- Superbowl XXV, but due to a season ending injury earlier in the year, he sat on the sidelines while the team won 20-19. There were two bittersweet points to the season. First, before the injury, Phil was having one the best seasons of his career with 15 touchdowns and only 4 picks. Second and finally, his injury opened the door for Jeff Hostetler, who created a QB controversy, that was only amplified by the Giants victory in the big game. The latter proved to be his ultimate undoing. With Parcells retirement, Ray Handley- (his right hand man) stepped up to the plate to be coach. He named Hostetler starter, and Simms was back to square 1 fighting for his job. While there were some bright spots there, the team itself slipped into mediocrity. Simms still had one good season left in him though, and threw for 3,038 yards and 15 TDs, before retiring in 1994. 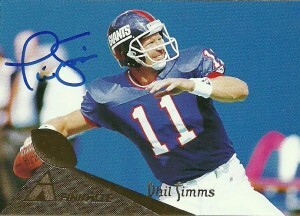 Simms is a highly underrated quarterback who really has never gotten his due for his time playing for the Big Blue. He played 14 seasons, spanning 3 decades of football, and really after the game slowed down for him, was an understated reason why the Giants became true contenders. A master of the audible, Simms could pick teams apart with his recognition of defensive alignments. A true pocket passer, Simms was oft-injured and frequently criticized for taking needless sacks to avoid an interception, but you can’t deny his abilities as a winner (95 wins) and playoff leader (Super Bowl MVP). 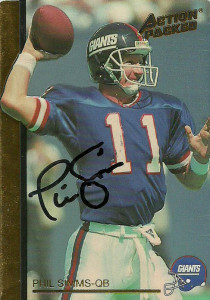 Phil also was the 1985 Pro Bowl MVP, has had his number retired by the Giants, and is a member of the team’s Ring of Honor. It really is an injustice that Simms is not in the Hall of Fame. Phil has enjoyed a career as a color commentator in sports and NFL football. Well respected by most of the networks, Simms made the transition from a player to a broadcaster seem effortless. His sons, Chris (UT) and Matthew have both gone on to play quarterback in the NFL. He is also of a select group of players who show up in the original Tecmo Bowl and its sequel Tecmo Super Bowl.